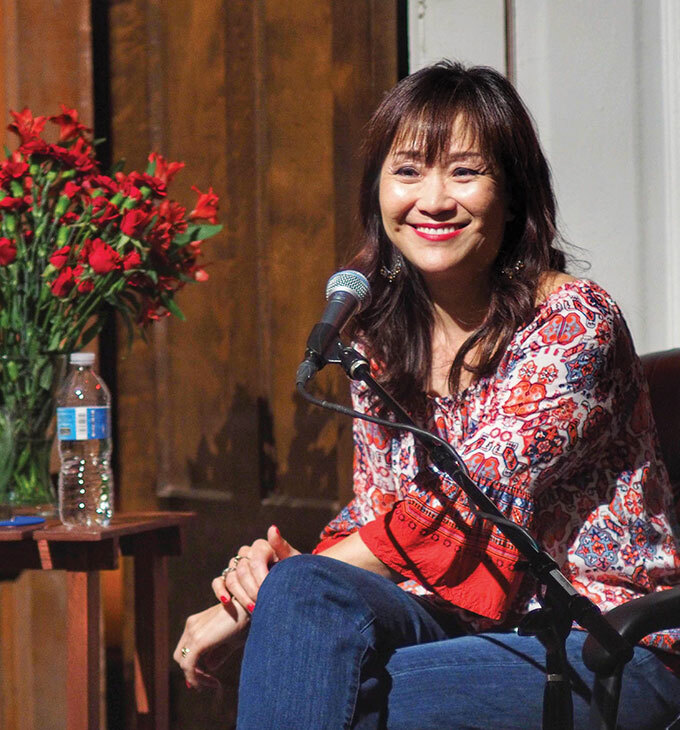 Recently the Companion editors sat down with Kathy Khang to ask her about her new book and how it speaks into today’s national conversations. I was thinking about all the people I encounter on a daily basis who care deeply about a variety of issues and speak very passionately—until it comes to the moment where they need to take it a step further, beyond a one-on-one conversation. It is one thing to talk about things you’re passionate about with the understanding that you’ll all agree. But there’s some hand-wringing about how to speak out publicly about the things that people care about. It felt like a good practice to put things down on paper and see how it all came together. And now it turns out that the timing of this book could not have been better. There are a lot of moving parts in our political world and in how it relates to the evangelical world as well as with the broader Christian faith world. What does it mean to have a voice and why is it so important to raise it? I’m not just talking about your physical voice because we are all members of the body and each part of the body plays a different role. It’s finding the spaces where you can best influence the people around you, using the skills you have. For some people that is speaking and writing, but for others it is maybe art, photography, choreography, music. It might be in education. It might be becoming active in organizations or movements. There are a lot of ways to raise your voice, and I believe that’s what we are created to do. The idea of being made in God’s image as Creator is in part what raising your voice is about. How do we make sure that God’s kingdom come and God’s will be done on earth as it is in heaven? How do we know when we should and should not speak? Many of us have heard the phrase that “silence is complicity.” Ultimately that phrase is saying that if you stay silent about evil, you are partnering with it. I write a lot about Esther, who is invited to speak up on behalf of her people. Salvation comes from God, with or without Esther, but she has an opportunity to join in God’s work. That’s what I want people to wrestle with. It is uncomfortable to speak out on something that maybe you don’t see your neighbors speaking out about or taking any action on or that you don’t hear about at your church or book club circles. It is hard to be the one to say, “Hey, maybe we should take a look at this.” God is going about God’s business, and we have the opportunity to join God. It seems that we’re in a time where there is more shouting at each other than trying to have real conversations. How do we raise our voice in a way that is constructive and helpful? It is especially difficult when people are skeptical about what is factual versus what is true to someone’s personal experience—then you add the layer of social media. Just as with any new technology that helps people communicate and connect, we are still learning the rules around engagement. Hopefully those rules around social media and the public sphere do not override the rules of personal, face-to-face engagement. That takes modeling and patience. And it doesn’t always happen. I put a lot of things on social media. There’s nothing I put out there that I would not say to someone face to face—I do not make personal jabs. I tend to share other people’s ideas and content—books I’m reading, TV shows I’m watching, questions I have. So just as I would in a friendship or a face-to-face relationship, there is the talking and then there is asking questions, which I also think is a lost art. How does the message of your book relate to our current conversations around #MeToo and #ChurchToo? It has everything to do with those conversations. They aren’t limited to Hollywood and the entertainment industry. They aren’t limited to the Catholic church or the mega-church. Sexual abuse is happening, and women by and large have been silenced. Women are beginning to find ways and spaces to make their voices heard. I think that’s one of the great things about social media. For all of the negative things we talk about happening in the virtual space, it is a space that gives people opportunity to put their stories out there and to find other people who will listen and believe them. How can women raise their voices? What would you like to say to that group of readers? I would like them to know that before they utter a word out loud, God already knows. God already knows and hears their stories and has heard and knows their pain. I want them to know that there are people who believe them and are holding space for them to speak truth, speak truth to power, to tell us what has happened, and to help us find a way forward. Particularly for women who have grown up in more conservative spaces—there are a lot of spoken and unspoken rules about when women can speak or should be heard and in what circles. I think it’s a new day with not only access to social media but the ability to gather information from social media. It’s not just a way to push out a message, it is also a way to receive and hear and find community and resources. It’s beautiful to think about God already knowing our stories. That’s why I made sure to root the book in Scripture. I want readers to remember that these are not new stories. This is not a new experience—finding one’s voice, feeling like an imposter, wondering if anyone believes you, and risking everything. That has happened and it continues to happen. God is present—that’s an important truth. Historically the church hasn’t always been great at listening to those voices. What can we do now to address this subject? get help, who you can talk to in the church in ways that are appropriate for each age group and audience? I want to encourage pastors to be very honest and realistic and to take some risks and know that people are watching the news! Your congregation is asking questions and they are wondering what you’re thinking and what does the Bible have to say about this. What does God have to say about what’s going on, not only in the media and the entertainment world, but in the church? As a preacher on a Sunday morning, are you going to acknowledge what is happening? And for my fellow churchgoers, I would say, how are we checking our own biases and the stories and scripts that we’ve been told about sexual abuse and sexual assault. How do we understand what is appropriate and what is not? Are we willing to examine our own lens and how we’re listening to these stories? Who do we believe and why do we believe them? Or who do we not believe and why don’t we believe them? We also have a responsibility to engage in what’s going on out there.